Although not commonly photographed, Sh2-216 (aka Simeis 288) is a fascinating object along with its neighbors shown in this image. 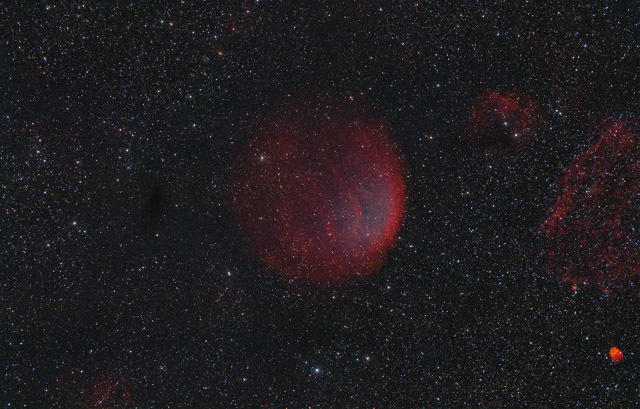 Sh2-216 is not only the closest planetary nebula to us, it also appears as the largest planetary nebula in our sky. With an apparent diameter of 1.6 degrees, the nebula is over 3 times the diameter of the full Moon. Its large size in our sky is due to its close proximity - its only about 420 light years from our solar system. As a planetary nebula, Sh2-216 represents one way that stars can die - it is the remains of shells of gases that a star throws off in its dying stages. A planetary nebula leaves behind a relatively small, dense and hot star known as a white dwarf. This image shows the remains of another way that stars die. The large red and blue nebula on the right edge of this image is part of the supernova remnant, Sh2-221. Under certain conditions, very massive stars will have their cores collapse and then the star can explode catastrophically in a supernova explosion. These types of explosions leave behind supernova remnants such as Sh2-221, and often leave an extraordinarily dense star known as a neutron star. Neutron stars are so dense, that a cubic centimeter of neutron star material weighs millions of tons! The small bright nebula in the lower right corner is Sh2-219. It is the opposite end of stellar evolution in that it is an HII (Hydrogen) emission region where stars are being born. This HII region is probably associated with Sh2-217, the diffuse emission nebula located between Sh2-216 (the planetary nebula) and Sh2-221 (the supernova remnant). What a complex field of view this is! In this image, North is Down. This image is cropped to 95% of the original frame. Software Used Images Plus 5.5 for camera control. Images Plus 5.75 for calibration, stacking, digital development, feature mask, smoothing and noise reduction, multiresolution sharpening and star shrinking. Photoshop CS5 used for levels and curves, hue/saturation colorizing, lab color, selective color, high pass filter, and unsharp mask. Gradient Xterminator for gradient removal. Registar for registration and stack alignment. Carboni Tools for additional noise reduction and smoothing. HLVG for additional color adjustment. Notes I am very happy with this image, as almost all of these nebulae are extremely faint. I'm also pleased with the HaOIIIRGB combo, as I think I captured a fairly natural color balance - including some subtle blue/green OIII in the supernova remnant Sh2-221. This image was published in the Reader's Gallery section of the August 2015 issue of Astronomy Magazine.